A lot of people. “Twelve million people go into a boulangerie” — a bakery — “every day to buy baguette,” the president of the Paris baker’s syndicate, Franck Thomasse, announced solemnly to the festive crowd in presenting the award outside Notre Dame cathedral on a recent Saturday. Opposite him, bakers were shaping dough, and next to him stood the mayor of Paris, the rector of Notre Dame, and the head chef of the Élysée Palace. Framing the scene was the intricate medieval bulk of Notre Dame. “Outside of France, it is one of the principal symbols of France,” Mr. Thomasse told the crowd, and there was nobody to contradict him. But when the runners-up in the baguette competition were called to the podium in the giant Festival of Bread tent, under the benevolent gaze of the city’s top spiritual, temporal and gastronomic authorities, one fact stood out. Nearly half the bakers had names that were distinctly un-French. Immigrants were disproportionately represented. 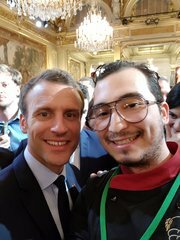 A selfie with President Emmanuel Macron. But there were few in the crowd to make a connection that appears obvious to Americans: immigrants and their offspring are naturally more inclined to take the tough jobs that natives reject, and work them hard. The Hamilton doctrine has yet to make inroads here. Mr. M’seddi, who works in his “laboratory” until midnight mixing dough, was initiated into the culture early on. His father Mohamed — his “idol,” to whom “I owe everything” — gets up at 4 a.m. to make the bread in an associated bakery. Some 1,200 boulangeries close in France every year. Boulangerie work is hard, and the elder Mr. M’seddi tried to keep his son out of it. The fact that immigrants kept winning the competition is merely “a reflection of the cosmopolitanism of the Ile de France,” the Paris region, said Denis Bourdain, a juror on the panel that awarded the prize.